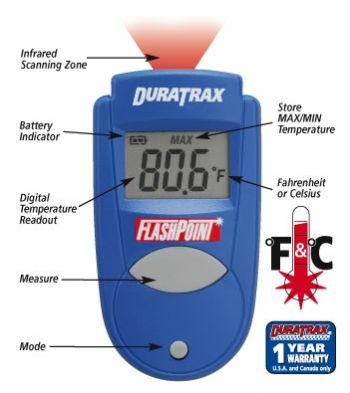 DuraTrax Flashpoint Infrared Temperature Gauge. Point and click! That's all that it takes to figure out the temperature of your brushless motor, nitro engine, esc or batteries. This is a tool every electric or nitro hobbyist should carry in their tool box! Wireless for safe and accurate readings without touching the heat source-simply point, push a button, and read the results. Special mode settings allow user to find, hold, and display minimums and maximums of fluctuating temperatures to provide the most accurate information. Replaceable 3V CR2032 Lithium battery available at jewelry and camera counters of major retail stores.